TODAY is Father’s Day. May I wish all fathers a Happy Father’s Day. Let me tell you a story about a great dad. Applying our societal standards, he was a nobody. He possessed neither wealth nor fame. But to his children, he was the greatest gift from God. Sue Yong was born on Sept 24, 1917 to a huge and wealthy Zheng family in the province of Fuzhou, China. Sue Yong’s grandfather, Zheng Peng Hui was a renowned and wealthy physician sharing the lineage of the famous Chinese poet in the Qing Dynasty, Zheng Ban Qiao. They lived in a huge mansion and were served by many servants. He was the 19th generation of the Zheng family. 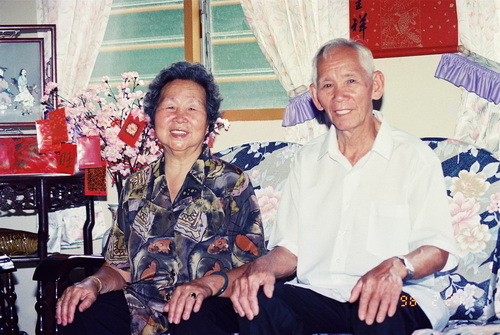 In 1947, with the prospect of the communists taking control of China, Sue Yong and his young wife Swee Mei decided to leave China. The Zheng’s family assets were later sequestrated by the communists when they came to power on Oct 1, 1949. Upon arrival, the young childless couple decided to settle down in Sepang, Selangor. There, they laboured as pig-farmers. Living under poor and malnourished circumstances, Swee Mei’s pregnancies were often fraught with problems. She suffered several miscarriages and three sons died a few days after their births. For Sue Yong, the life of luxury of his China days had also come to an end. There was no way he would return to China. Malaya was his new home. In Sepang, they lived in poverty and under constant fear of the communist insurgents Malaya was fighting at that time. As the pig farm was located far away from home, their livelihood was severely affected by the many curfews imposed by the security forces. In 1958, they decided to move down to Yong Peng. By this time, he had to work even harder to feed his five young children. Lunch and dinner were often porridge with soya sauce or a few slices of preserved bean curds. In Yong Peng, Sue Yong toiled as a labourer for landowners who required him to clear their smallholdings of weeds and lallang or make drains along the perimeter of the land. He did all these by using his cangkul, and for a meagre wage of six ringgit a day. Apart from having to work under the hot sun with his bare hands, such job offers were not regular. So, the household income was partly supplemented by his two elder daughters who gave up school to work as rubber tappers at the tender age of 10, each earning about two ringgit a day. Their quality of life only started to improve from the mid-1970s when Sue Yong started to get tree-felling contracts. But this job required him to live in jungles for one or two months, felling trees and clearing secondary jungle with his chain saw. It was an extremely dangerous job. So, whenever the taxi pulled up in front of the house with his tools, it meant Sue Yong had come home safely. But when he had to leave again for new assignments, his family would worry for his safety again. Often, Sue Yong had to dye his grey hair whenever he went around trying to secure contracts, fearing that prospective employers would find him too old to take up the job. He did not retire until he was 71, and that was also upon his children’s insistence. For him, education for his children was the best investment. Despite advice from relatives that he should get his children to stop studying and start tapping rubber or helping him out with his contract work, Sue Yong was adamant that he would do everything for his children so that they would not be deprived of education and end up to be like him. This is one fine example of what Ruth E. Renkel said: "Sometimes the poorest man leaves his children the richest inheritance." He was also a loyal Malaysian as he would often say Malaysia was his home and would be his final resting place. Since he came over here in 1947, he only went back to China once in 1983. That trip meant a lot to him because he had always wanted to make this "pilgrimage" to fulfil his wish and duty of paying his belated respects to his departed parents. A duty no doubt he fulfilled with admiration by collecting the relics of his late parents and having them buried with a beautiful tomb erected in their memory. But alas, just as he was able to enjoy the fruits of his labour in his twilight years, Sue Yong went missing on May 23, 2000 after taking an evening walk. He was 83. It was devastating for me. Tan Sue Yong is my father. When I received a call from my mother on that fateful evening, I immediately rushed back. With the help of local Rela members, we mounted a search around Yong Peng town but could not find him. For the next few days, the police field force and dog units joined the search. After one whole week of looking out for him in Yong Peng without any success, the reality of never seeing my dad again began to sink in. I remember hugging my wife and crying together as we agonised over our missing dad. We could not understand why someone who had given so much to us, would have his life end in this manner. When news came that dad was spotted taking a bus in Air Hitam, Johor, I knew he was now on the move, and no longer in Yong Peng. So, I had to abandon the search in Yong Peng and return to work. That evening, when driving my family home, tears just flowed down as I felt so helpless at that time. I felt as if I had failed him for not being able to find him. I felt as if I had not done enough despite all the time, money, resources spent and help from so many kind people. So, on Father’s Day 2000, which also fell on June 18, I took out advertisements in national newspapers seeking help in locating him, but to no avail. Six years have passed. By the seventh year, the law will presume he is dead if he is still missing. But hope is what I will not give up and will continue to pray that God will help us find him — whether dead or alive. Until then, it is difficult to have any closure on our part. The tomb that he himself designed and which was built some 20 years ago is still empty. Our tears still flow whenever we look at his photo or dream of him. We have dreamt of him many times hoping that he would reveal to us his whereabouts, but we would wake up each time just as he was about to tell us where he was. Dear Malaysians, though we are not rich, our lives have been enriched by him. Our dad taught us honesty, hard work and filial piety. Always more concerned about providing for his family, he did not drink, smoke or gamble, let alone indulge in unfruitful activities. He even helped around with household chores. Many a time, the mere thought of what our dad went through to bring us up would always provide us the much-needed jolt to remind us how blessed we are because of him. On this special day, I pay tribute to this great man in my life. We are not who we are today if not for our beloved dad. The toil and sweat he had put in would not be in vain. Because of him, all his grandchildren are now able to receive tertiary education. We are a family brought up by a man deprived of everything but who gave his all to us. He will remain in our hearts forever. So Malaysians, I have no doubt this evening many of you will take your dad out for dinner. But except for this special day, when was the last time we took our dad out for a meal or sat down to have a good chat with him? And when was the last time we gave him a pat or a hug or said, "I love you"? In fact, just a week ago, our Prime Minister Datuk Seri Abdullah Ahmad Badawi, when launching the Royal Malaysia Police Family Day, advised us to value our family members while they are still alive and shower them with love so that there will be no sense of guilt later. Why not whisper them to me? Don’t you know it would make me happy? The writer is a lawyer. Please visit www.missingourdad.com for more information about his missing father.